When I was in middle school I lived in Westport, CT and would take the train into NYC to spend the weekend with my late aunt, Melissa. She worked in the film industry and seemed impossibly sophisticated in her fashion and food. A favorite tradition was having breakfast at Sarabeth’s. We’d order perfect popovers, which were puffed to the heavens and slathered in her homemade marmalade and/or honey butter. They reminded me of the puffy pancakes my friend Sasha and I had made (when we were just tiny kids) in our commune kitchen, but so much more delicious and light. The perfect popover is crisp on the outside, tender and airy on the inside and at its very best when served right from the oven. This is a super easy and yet very impressive recipe, that even a first time baker can master and feel like they’ve made magic. When I was at the University of Vermont studying theater, studio art, English lit, philosophy, photography, Latin, art history and everything else a Liberal Arts Degree offers, I decided to throw a business class into the mix. Truth is, I was just fulfilling a math credit requirement. I learned how to balance a checkbook and some basic—very basic—accounting, which went something like this … don’t spend more than you make! Then the professor had us write a business plan. It was the mid-1980s and I grew up eating Mrs Field’s, David’s and Famous Amos cookies, which were the “gourmet” cookies of the day. While in college I was also the “baker” at a favorite breakfast joint in Winooski, VT and spent my free time baking to relax after classes. So, I wrote my business plan based on a fictitious cookie company called Zoë’s Cookies. I can’t remember how I did in the class, but six months later I was standing on Church Street in Burlington, VT, selling my cookies from a hand pushed cart. A croquembouche (kroke-em-boosh) is a tower of profiteroles (cream puffs) stuck together with a thin layer of crisp caramel, which gives the dessert its name, “crocque em bouche” or “crunches in the mouth.” This dramatic pile of puffs is typically served at weddings, but I’ve taken liberties and find it a worthy dessert for any big occasion. A Christmas Croquembouche seems like the perfect way to celebrate this holiday season. The puffs are made of choux paste and are filled with mango pastry cream, which isn’t a flavor you might think of for a Christmas dessert, but it is such a wonderful contrast to the sweet of the caramel. When you break into the cream puffs you’ll find the rich, creamy golden filling. Just to jazz it up and to continue the holiday theme I added snowflake sugar cookies that I made with an olive oil sugar cookie recipe from my friend Sarah Kieffer’s book, The Vanilla Bean Baking Book , which is one of my favorite cookbooks. Then I spun some sugar into fine threads and wrapped it around the tower of puffs in a garland. I really, really wanted to start this post by bitching about the weather. Something my poor family has to endure for much of the winter. But, I’ve decided to rise above the whining-chatter in my head and embrace the weather. It is easy today, at a balmy 42°F. A small, but welcome comfort after an epic freeze. Instead of complaining about the cold, I made hot chocolate and homemade marshmallows. It reminds me of being a kid, when I loved winter and playing outside. 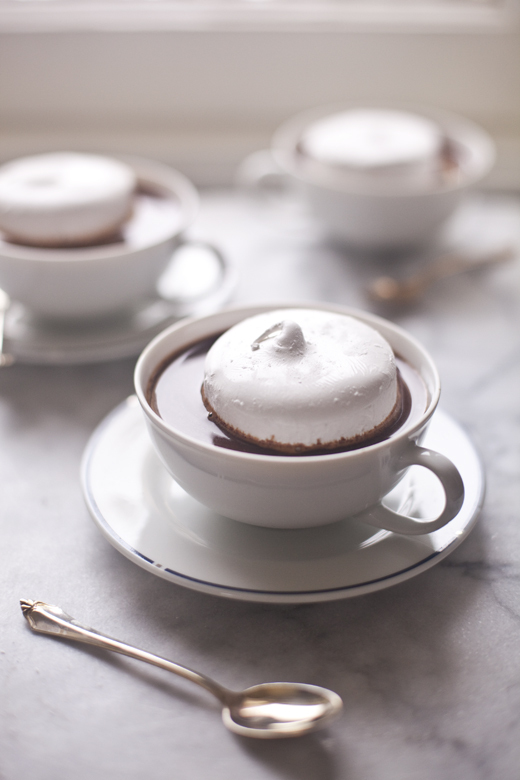 There is just something magical about the puff of a marshmallow and how it floats on top of hot chocolate, melting just a little to make a layer of sweet fluff. Totally comforting. Nothing beats that, except now I prefer my hot chocolate with a shot of whiskey and my marshmallows scented with a touch of mint or vanilla or even cardamom. Last week I was gifted cardamom scented marshmallows by Lee, who owns l.c.finn’s Extracts. Homemade marshmallows are a brilliant idea and one I have never shared on the site. I’ve always made marshmallows by whipping egg whites and then suspending them with sugar syrup and gelatin until they are light as air and chewy. I adore the texture, but I can also detect the faintest taste of the egg white. This doesn’t bother me if I am layering the homemade marshmallows with other bold flavors. But, when I am going for an adornment for hot chocolate, I prefer a recipe that has no egg. This recipe for homemade marshmallows is just a combination of sugars and gelatin, simple as that. You can keep the marshmallows pure or play with flavored extracts and fun colors. They store for weeks in a dry spot, which is super easy this time of year in MN. Anytime you come home after braving the cold, just make up some hot cocoa and float a bit of happiness on top. I am using sheet gelatin in my recipe, but I have also given the instructions for using the powdered variety. You can watch me use both types of gelatin in my instagram video. I got used to using sheets when I worked in restaurants and just find it easier to deal with. The sheets also have less of that kindergarten-glue flavor. You can find the gelatin sheets on Amazon if you want to give them a try. You can watch me make the marshmallows in my instagram video. I find myself digging into the past recently and finding recipes. My grandmother’s rugelach, cheese blintzes from the Kiev restaurant (a childhood favorite) and fresh homemade yogurt my mom used to make. We lived on a commune in VT, where we grew our own vegetables and raised a cow for dairy. Everything was local and organic, because if we didn’t produce it, we couldn’t afford it. My mom was the one to milk the cow, which she then made into homemade yogurt, butter and cheese. The flavor of that homemade yogurt, made from fresh milk, was divine. 48 years later, in Minneapolis we are allowed to keep chickens, but the city hasn’t approved urban dairy cows, so I just buy milk for making yogurt. Not as romantic, but still tasty. Now that I have started making my own, I may never buy yogurt again. Homemade yogurt is so easy and has such an incredible flavor. Even my boys like it better. I happen to love it plain and tangy, but I’ll also put a layer of preserves on the bottom when I am in the mood for something a bit sweeter.